Copa90 decided they wanted all the Euro 2016 Goals Animated. They asked us if it was possible… yep no probs, sounds amazing. Then they asked if they could have them as they happened (!) as close to real time as possible (! )… oh, right yeah think so, let us do some tests and we’ll get back to you. We worked out a production workflow involving multiple animators working simultaneously on the same animation. The test went well so we agreed to take on the project. So, 23 game days, 51 games, 108 goals, 452s of animation, 5,304 hand drawn frames later and we had achieved did it. Some long days & some late nights but what an experience. Most of the time we were able to turn a goal animation around in around 45 minutes to 1 hour. The craziest games to work on was Portugal vs Hungary which ended 3-3 and also France vs Iceland in the quarter finals – a 7 goal romp with France turning over the Vikings 5-2. Key for our client was making sure the goals were completed as soon as possible. Notably the first goal in the Albania vs Romania game was completed before the final whistle was blown. By the next morning copa90’s post on twitter had more than 1.4 million views. 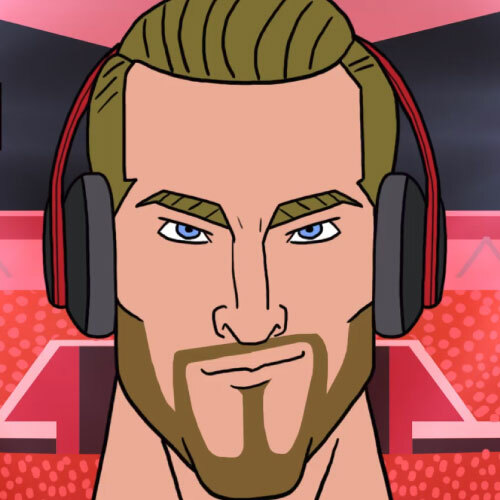 As the tournament progressed each animator found their ways of improving the quality of the animations but maintaining the speed necessary to keep the goals trending on social media.